The first of Fossil's many, many, many designer hybrid smartwatches of 2017 is now on sale, the Q Accomplice. It looks like a normal watch, works with both iPhone and Android, and all the tech is hidden inside. So, simple and discreet. This year's assortment of Fossil wearables come with slimmer forms, new designs and more connected features to make them better companions to your smartphone. It's worth noting that the Fossil Q Accomplice has identical smart features to the Skagen Connected Jorn and Hald models for 2017, which we've already tested out. The only real difference is the branding and the designs on offer. Likewise, many upcoming hybrids from Fossil, Michael Kors, DKNY, Marc Jacobs and Emporio Armani will arrive with the same combo of basic activity and sleep tracking, notification alerts and customisable buttons. The Q Accomplice is damn stylish on the wrist; it's polished enough and has plenty of personality for the price. At 38mm, it's the exact right size watch face to be unisex preppy but classy, light and comfortable, and also fairly slim at 11mm thick. I wouldn't say no to another millimetre or two shaved off but it doesn't feel chunky, which is better than most smartwatches right now and a big improvement on last year's cohort. For women searching for a hybrid smartwatch, this could be the one for you. The stainless steel case itself comes in a range of finishes, including silver, a matte gold and navy blue and is water resistant to 3 ATM - splashproof really, no good for showering with. The best thing about it is that this looks like a slick, regular wristwatch so it really has that hideable appeal - you can be counting your steps and no-one will have a clue. Now, I've tried out the Accomplice with both the stainless steel band and the 16mm sand leather band. If you don't mind the feel, I'd spend the extra on the stainless steel band or at least go for a darker colour, or buy a bunch of extra straps - you can quickly swap them with a pin release. The reason being that the strap holds stains terribly (as you can see from the pics) - now I'm not known for being precious with my wearables but after just over a week, the sand strap looks atrocious and I can't even pinpoint what's caused it. I wondered if it's just me, but a glance through the user reviews on Fossil's site told me it isn't. That's a shame. Fossil is not attempting to hide the fact that its priority has been on getting its hybrids slimmer, smaller and sleeker for 2017. There are a few new smartwatch-style features though. Notification vibrations return - the haptics are quite subtle, so much so that you might miss them - but I actually prefer this to loud, buzzy watches that draw too much attention to themselves. You can set notifications up in the Fossil Q app so that when the Accomplice is connected to your phone via Bluetooth, you can get a vibe for alerts for all calls, all texts or individual apps including WhatsApp, Instagram and Facebook. You don't seem to be able to choose all apps at this stage, though chances are you wouldn't want to. You can also filter alerts by contacts - assigning individual contacts or apps a number on the watch face (on the new Skagens, the face also has different colours to work with so there is a slight difference). I did this by giving WhatsApp pride of place at 1 o'clock then various friends and family the other hours. This is a bit of an investment if you really want it to work so best to stick to just a couple to really enjoy the alert filter aspect. For me personally, if my phone buzzes and it isn't WhatsApp then it's probably not urgent. Some work ethic, I know. The new functions for 2017 consist of making those three buttons on the side of the watch do some work. You can set them up to do things like control music/volume (on your phone not the watch), show you your activity progress (via the 0-100 dial on the left side of the face), tap your progress on a lifestyle goal, take a smartphone selfie, show the date, show a second time zone, start the stopwatch or ring your phone. You tweak these in the 'Fossil Favorite' tab of the app - the one with the icon of the watch. I actually quite liked these simple but sensible additions with one caveat - I had some connectivity problems (see below) and when the watch isn't connected it makes them all useless. Still, I always had a pretty watch on my wrist and not a blank screen, which is nice. When it comes to activity tracking, I seem to have got on slightly better with the Q Accomplice than Hugh did with the Skagens. It is admittedly basic when compared to what you get with a Fitbit but for steps and distance it was accurate, if a little stingy. It tracks steps, distance and estimated calories - no active minutes here or logging workouts though you can hook this up to Google Fit, Under Armour and UP by Jawbone (RIP) for two way syncing in the 'connected apps' tab. I wore the Q Accomplice alongside the Fitbit Alta HR and found that the Fossil came up slightly under the true distance, the Fitbit a smidge over. If you're trying to move more, get fit or lose weight, this is not really a problem then - ditto the fact that Fossil's estimated calories were in some cases only a third of what Fitbit was spitting out. When you scroll down to the week view in the app, you get a handy hint e.g. "walk 45 minutes to reach your step goal" which is nice as well as a month view with average steps per day. That's it in terms of insights, though, apart from a fullscreen badge when you achieve your most active day. If you don't mind wearing what is an obvious tracker all day, you'll be better served by a dedicated device that tries harder to motivate you. Sleep tracking is broadly accurate but really limited if you actually want to make some changes and feel more rested. The watch is light enough to wear in bed but not ideal with the chance of buttons digging into your hand as you snooze. It shows you the time you spent awake, in 'light' sleep and in 'restful' sleep in the app and you can set a goal e.g. eight hours - you'll get a 'best streak' when you continuously hit that. Plus it doesn't pick up on nap time during the day, as I discovered when hungover earlier this week - worth noting if that's part of your routine. A note on connectivity - I have yet to meet a Fossil/Fossil Group device that gets on with my Android phone. when I hit 'connect' or 'sync' in the app I expect it to connect and I expect it to sync. This doesn't always happen - still! - and it's getting rather annoying. The Q Accomplice also disappeared from the tab in my Fossil app for no reason meaning I had to set it up twice - no bother as it's quick but if I'm having these problems, the thousands of people buying these watches sure will too. Battery life is a big plus and I can't stress enough how much of a joy not charging a hybrid watch is. 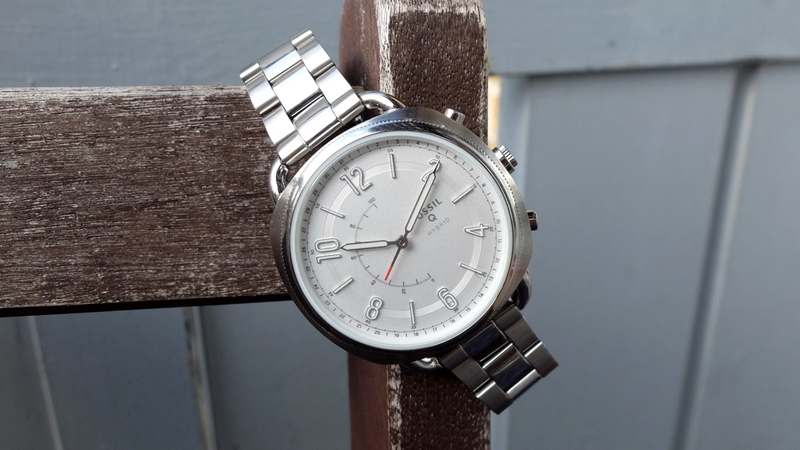 The Nokia Steel HR, which is excellent, needs charging every 25 days. That's doable but I'd prefer the four to six months on offer here, thanks to Misfit's clever tech inside. When it runs out of juice, you have to buy a new CR2412 coin cell battery and swap it - the kind of all or nothing hassle that I can handle two or three times a year. Incidentally the Fossil Q app does warn you that turning on notification vibrations does reduce the battery life. If you want basic activity tracking, alerts and some smartphone controls in a gorgeous package go for a Fossil hybrid like the Q Accomplice. Sure, you might encounter some connectivity problems along the way and you may be itching for more features before long, but this is a solid starter wearable for the fashion pack.